It is reasonable for the state to regulate many things, like pesticides or nuclear power, but feeding the hungry is not one of them. Particularly when nearly 5 million people in California go hungry each month. The California Association of Food Banks reports that 1 in 5 children go hungry daily in the state so why do authorities who cannot meet this need believe that can grant permission to people seeking to address the crisis? An emergency that could be solved with the state’s $201.4 billion budget if it had the political will. The sharing of food with the hungry is an unregulated gift of compassion. It always has been and always will be as long as those feeding the hungry continue to defy efforts at social control. The government does not have to the authority to determine how we care for one another. Any idea that it can is criminal. But the state of California plans to regulate the sharing of meals with the hungry even though the state is unable to feed millions of people in need. Governor Brown signed AB- 2178 – Limited Service Charitable Feeding Operation on September 18, 2018. The law will take effect on January 1, 2019. Food programs all across the state could be told to stop sharing free meals with the hungry until they are granted permission from state Health Departments. It is not clear what county Health Departments plan to do if there is statewide noncooperation with the law. Many groups that feed the hungry outside are already preparing to resist. State officials claim this law will make it easier for people to get an Environmental Health Permit but will require groups to cook in a commercial kitchen. AB- 2178 removes the Environmental Health regulation restricting non-commercial food operations to three days in any 90 day period. While the new bill takes away the three days per three months limit, according to AB- 2178 groups would be limited to serving food prepared in a commercial kitchen or could only share whole, uncut produce and prepackaged, “nonhazardous foods” in its original packaging causing hundreds of California food programs to secure commercial kitchens provide food that is not useful to those living on the streets or defy the new law. I received an email on October 23, 2013, that started, “Hello Food Not Bombs, My name is David Conway and I am the Environmental Health Director for Mariposa County, CA. I am a member of the California Conference of Directors of Environmental Health Food Safety Policy Committee. I am working with other Environmental Health Directors around the State of California to try to make feeding the homeless/hungry easier for groups such yours.” It seems the issue of how to respond to complaints by anti-homeless activists came up at their 58th Annual Conference held that September in South Lake Tahoe. I responded by writing that the sharing of food was an unregulated gift of compassion and did not require their help. I also explained that Food Not Bombs had adopted a policy of never applying for or excepting permits from the government or corporations at both the 1992 and the 1995 International Gatherings in San Francisco. A global policy based on our history with that city’s permit process. The purpose of food safety laws is to regulate commercial food establishments that have an economic incentive to serve unsafe food. Until recently, this concept in law was generally understood. That was until a well-meaning young State Assembly Person, Monique Limón introduced AB-2178, called the Limited Service Charitable Feeding Operation on February 12, 2018. Starting on January 1, 2019, grassroots organizations like Food Not Bombs will be required to pay fees and seek commercial kitchen space or be threatened with fines and arrest. While state officials claim that this law will make it easier for those feeding the hungry to get permits but in reality, this will be providing anti-homeless groups a new weapon in their effort to shut down the public sharing of food with the hungry. But instead of making the process easier the law will force people volunteering to meet the needs of the hungry to comply with the most expensive parts of the Environmental Health Regulations that until now were only required by commercial food establishments. Yes, AB- 2178 is providing another tool in the campaign of those seeking to drive the homeless and poor out of sight. This law was created because of pressure by groups wanting the homeless to disappear. According to Justin Malan, Executive Director of California Association of Environmental Health Administrators, Freddie Agyin, Los Angeles County Environmental Health, and Jimmy Wittrock, legislative assistant to Assembly Person, Monique Limón, AB-2178 was created in response to complaints to local Health Departments by people wanting about groups feeding the hungry shutdown. All three each the law was intended to provide a uniform state response to these complaints. When I asked about the number of people claiming to have been made ill eating at all volunteer programs, they had no direct information that could link the meals they seek to regulate with any reports of food borne illnesses. This Environmental Health law has nothing to do with protecting the safety of the hungry and everything to do with local campaigns to force the homeless out of town. That might be why the California Association of Environmental Health Administrators is not concerned that tens of thousands of the states hungry will be forced to seek their food out of unsanitary garbage cans. We can already see that the requirement to prepare meals in a commercial kitchen is likely to force most outdoor food programs to close. Anti-homeless groups and their political allies will harass those providing commercial kitchen space into kicking out these outdoor meal programs. A volunteer with Santa Monica Food Not Bombs called me on August 29, 2018, to say that someone from the anti-homeless group, Residocracy Santa Monica, took photos of the group when they were sharing meals with the hungry at Wilshire Boulevard and the Third Street Promenade and posted them on Facebook asking people to complain to the First Presbyterian Church where Food Not Bombs was preparing their vegan meals. As a result the church told Food Not Bombs we could no longer use their kitchen. They are now planning to cook at Salvation Army and share the meals inside the Salvation Army Building which will not only reduce the number of people being helped but hide the efforts of our group to build support for real solutions to hunger and poverty. Not only will Food Not Bombs message of diverting military spending to social needs be diminished our volunteers are likely to be perceived as supporting the policies of the Salvation Army, many of which Food Not Bombs has spent the last 38 years organizing against. Winterer and Mayor Pro-Tempore Gleam Davis asked the City Council to allocate $20,000 of discretionary funds to the Salvation Army for infrastructure improvements to host the meal service. The Salvation Army already has a meal service on weekends but will use the money to improve its restroom facilities among other repairs. The Salvation Army and West Coast Care could have staffed the weekly Food Not Bombs meal any time during the past ten years but since the goal is to force the homeless out of sight to encourage the impression that Santa Monica has no homeless to blight that shoppers experience they have only now decided to offer help. I suspect Santa Monica Food Not Bombs will find this arraignment unsatisfactory and return to the Third Street Promenade and their effort to encourage public dialog about ending war and poverty. The Santa Monica Food Not Bombs chapter was one of the few of over 50 Food Not Bombs groups to even have access to a commercial kitchen. If our groups were to raise the money to pay for the permit and followed the restrictions they would be limited to handing out produce and cold snacks that they would need to buy. Food Not Bombs currently recovers fresh produce, baked goods, and grains which they prepare into healthy nutritious meals. People without housing can do little with uncooked produce and the expense of buying prepackaged, nonhazardous foods in its original packaging would be prohibitory expensive for most groups. Assemblyman Eduardo Garcia’s bill allowing the sale of home cooked meals offered some hope to groups who sharing free meals with the hungry who cannot secure a commercial kitchen. AB – 626 allows cities and counties to authorize and permit homemade food sales as a new category of “retail food facility” was also signed into law on September 18, 2019. To understand why Food Not Bombs has a global policy against seeking permission from the authorities and refuses the offer of permits one only needs to consider San Francisco Food Not Bombs experience with the local Environmental Health Department. The San Francisco Police arrested nine volunteers for sharing food with the hungry at the entrance of Golden Gate Park on during lunch on August 15, 1988. The police made nearly 100 arrests by September 4, 1988, at a cost of least $116,000 according to a letter received from the police department by Supervisor Terence Hallinan. 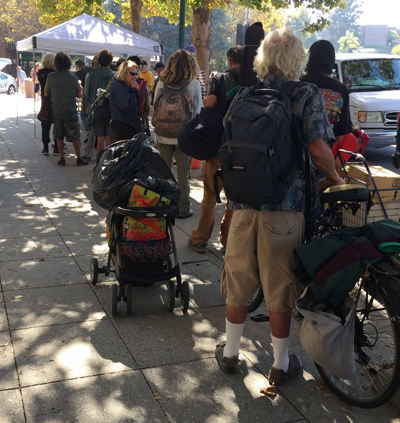 “It’s illegal to give away food in the park to more than 25 people without a permit,” Sargent Jerry Senkir told UPI journalist Chris Chrystal on September 5, 1988, “This outfit has never applied for a permit,” Senkir continues. After months of Environmental Health Inspector Al Chin stringing us along with weekly additions to qualify for a health permit Food Not Bombs sued the city. The case was sent to Federal District Judge Peckham. After hearing our concerns the judge ordered the city to provide one last list and if we complied with the requirements we were to be issued a health permit. The media assembled outside San Francisco City Hall to report on the issuing of health permit D 2258 on September 11, 1989. A second Permit to Operate numbered D2260 was issued to Food Not Bombs on March 13, 1990. Food Not Bombs had its March 1990 permit withdrawn when a health inspector who was interfering with the assembly of our food facility tent witnessed a hungry person helping himself to a slice of sheet cake some one had placed on our table before we had displayed our permit to operate. This is a solution without a problem that will be a problem if it is enforced. There is no evidence that hungry people have been made ill eating at meals shared in public spaces by community activists. The problem for health departments is their need to respond to people trying to stop the sharing of free food with the hungry. There will be California Food Not Bombs Gathering from November 10th through the 12th at the Omni Commons, 4799 Shattuck Avenue, Oakland, to organize a statewide response to AB-2178. I encourage all groups who believe this law is directed towards their work to let their local Environmental Health Director know they will refuse to cooperate and that they are in solidarity with all other outdoor food programs who also intend to ignore requests for compliance with AB-2178. If the authorities can issue your group a permit, they can take it away. Local anti-homeless activists will make sure your permit is pulled by tormenting the owners of anyone lending food programs a commercial kitchen. Don’t cooperate with this hunger promoting law. Sharing free food is always an unregulated gift of compassion.